LOS ANGELES – July 11, 2016 – Team Shelby, the official car club of Shelby enthusiasts worldwide, will create the ultimate Shelby Event along with the HPDE (High Performance Driving Experience) in South Florida with the 1st Annual Team Shelby South Atlantic Region Summer Party. The 4 day celebration, which will be held on July 14 – 17, will feature full-throttle action and excitement for automotive enthusiasts of all ages at multiple high profile tracks, dolphin swim, long distance poker run and thrill rides. 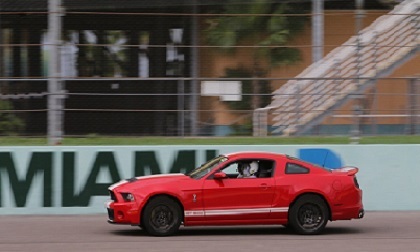 Throughout the weekend, Shelby and Mustang enthusiasts can participate in exciting activities including track events at Palm Beach International Raceway and Homestead-Miami Speedway, a poker run from Miami to the Florida Keys which includes pace laps at Homestead-Miami Speedway with a stop at Dolphins Plus Key Largo for a BBQ and Swim with the Dolphins and ends at the Famous Holiday Isle Tiki Bar with 100 MPH boat rides available for those who dare. Shelby fans will be able to mix it up on the track next to high performance machinery by Ferrari, Lamborghini, Porsche and other car marques. Shelby American will display its latest vehicles including the new 750+ horsepower Super Snake, Shelby Terlingua Shelby GT, 50th Anniversary Daytona Coupe and the 50th Anniversary Edition GT40. Vince LaViolette, Director of Manufacturing, Research and Development, as well chief test driver Shelby will give Team Shelby members thrill rides in the cars. In addition to the driving sessions at Homestead on Sunday, Benefit Car Shows will host an Infield Car Show at Homestead Miami Speedway. Attendees looking for more sedate fun can take in the Sunday Car Corrals. Attendees are also encouraged to visit the Shelby American display with several of their latest performance cars and speed equipment. Registration for the event is open to all makes and anyone who appreciates the fine art of automotive performance. For more information about the 2016 1st Annual Team Shelby South Atlantic Summer Party, please visit https://thehpde.com/SpecialEvents/ShelbySummer. Other exclusive Team Shelby opportunities can be found at www.teamshelby.com. Carroll Shelby founded Team Shelby in 2008 to give people an opportunity to enjoy their cars with fellow enthusiasts. Shelby vehicle ownership is not required, only a passion for the marque and lifestyle. Additional information is available at www.teamshelby.com.